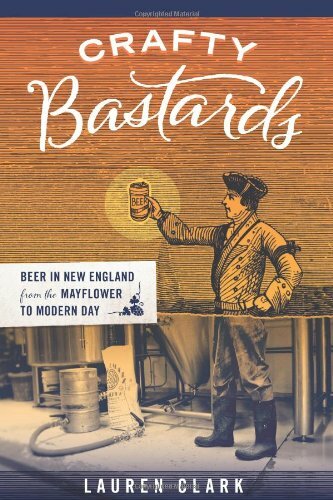 From there Crafty Bastards: Beer In New England from the Mayflower To Modern Day (Union Park Press, Paperback, $18.50, 200 pp) launches into the complicated, celebrated and often chaotic history of beer in America’s Northeast. There is no shortage of amusing, interesting and rich anecdotes. This is, after all, one of the more colorful sections of the country, and the beer has often matched the spirit. Throughout this historic romp, the author deftly crams in as many tidbits as possible while weaving an engaging narrative, avoiding the stuffy tone that often accompanies history books. What is likely the strongest aspect, however, are the chapters dedicated to the renewal of regional brewing over the last three decades. There is the obvious homage and examination of the now very large Boston Beer Co., makers of Samuel Adams beer, but also early pioneers, like Catamount Brewing Co., which opened in 1986, and went out of business in 2000, a time when many other first-wave revivalists in New England closed shop. Clark takes readers on an entertaining journey across five centuries of New England beer history, highlighting Yankee ingenuity as it relates to the region’s beer-making heritage and present.